The appeal of a convertible is plain to see – good looks, especially with the top down, and the joys of wind in your hair motoring. Most of us need to use our cars all the time, though, and need practicality too – space for four passengers and their luggage, good build quality and reliability and, most importantly in this day and age, low running costs. Here are four ways to have your cake and eat it. 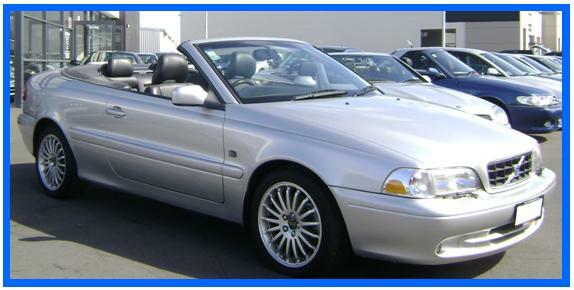 Saab 9-3 Convertible (2003 to present) Saab has had its ups and downs over recent years but the 9-3 soft top has been a consistent success story. 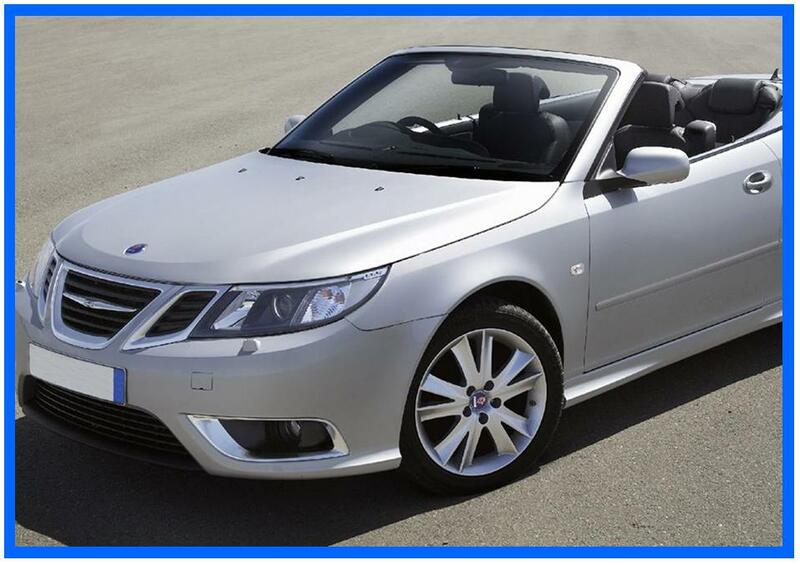 The styling is still crisp 8 years down the line and it retains several of the quirky features that Saab loyalists cherish so dearly. Mechanically it has been left behind though; the 150bhp 1.9 diesel takes a painful 11.2 seconds to drag it up to 62 and the scuttle shake and under steer are relics of yesteryear. On the plus side, it is a reasonably well built old bruiser and there is plenty of room in the cabin. It’s relatively cheap too, a four year old with a mere 45,000 miles on it will cost you £7,500. Have you been persuaded? Perhaps we will be seeing more convertibles in Sutton Coldfield soon. As stately as the queen and as understated as a Barbour jacket, the Silver Shadow was the first modern Rolls Royce. This car was an exercise in craftsmanship; the Connolly hide seats were hand stitched, the burr walnut dash was hand polished and only the finest lamb’s wool would do for the carpets. The self levelling suspension gave a ride that is a match for a modern day Jag. Power from the huge 6.75 litre V8 was described as “adequate,” certainly enough to waft this hefty car along in near silence. Prices start at £2,500 but a pristine 1977 model with a scant 80,000 miles under its belt can be yours for £8k. The Camargue is a 2 door coupe based on the floor pan and mechanicals of the Silver Shadow. The Pininfarina styled body is timelessly elegant and hugely luxurious. In 1976 this was the most expensive car in the world and the fact that only 500 were made makes it extremely collectible. Even so, I found a truly immaculate 1982 model with 64,000 miles on it for £43k. That may seem like an awful lot of money but this is a car that is only going to increase in value. The Silver Spirit was a new car for a new age. The 80s were all about brash, go getting entrepreneurialism and this new Roller reflected that with its monolithic, in-your-face styling. It was as big as the QE2 and as luxurious as Donald Trump’s penthouse suite. The owner was more likely to be boss of his own company than a titled landowner and more likely to be behind the wheel than sitting in the back. Unfortunately, it was based on the same mechanicals as the Silver Shadow and retained the same aversion to corners and lack of performance. This might explain the falling rock depreciation – these days you can pick up a ’93 model that has been barely run in over 49,000 miles for £7,500. By the time the Silver Seraph came on the scene, Rolls Royce had fallen into Volkswagen ownership (they kept the Bentley brand and sold the Rolls Royce name to BMW). The engine was a 5.4 litre BMW V12 that finally gave the car the power it deserved. The electronics, equipment and running gear were all state of the art, but a lot of the craftsmanship that was a Rolls Royce hallmark had been lost. Visually, it was sleeker, curvier and more compact than anything that had gone before. Unfortunately, those compact dimensions also extended to the interior. You can pick up a ’98 model with a minimal 74k on the clock for £28,000; not bad for a car that cost £155k when new. Jeeps have always been the American equivalent of the Land Rover, iconic vehicles with a reputation for toughness, off road ability and practicality. The Wrangler rivals the no frills workhorse Land Rover Defender while the Grand Cherokee offers a kind of cut price alternative to a Range Rover though without the build quality, luxury or prestige. The Grand Cherokee in particular has been a steady, if unspectacular, seller over here but has always seemed more at home in its American heartland. Somewhat belatedly Jeep has seen the writing on the wall for big SUVs and is pushing its Compass crossover heavily at the moment. The Compass has actually been around since 2007 and the original version was notable for its switchable four wheel drive system and one of the ugliest noses ever to be slapped on a car. This new version features heavily revised styling, new engines and a choice of either permanent four wheel drive or front wheel drive. Of course, the whole point of a crossover is that it combines the street presence and elevated driving position of an SUV with the practicality, low running costs and road manners of a family hatch. Will Jeep be able to pull off this trick with the same panache of the Nissan Qashqai and impress motorists in Sutton Coldfield? Straightaway, I have to say that the styling is a huge improvement on what went before. The chunky grill and headlights blend nicely with the squared off flared wheel arches and the sharp lines of the bodywork to deliver a pleasing combination of chunky offroader and crisp contemporary styling. Step inside and there is plenty of room for five adults on comfortable (leather in the case of my test car) seats. Put the back seats down and you get a load area the size of a small van. There’s plenty of kit as standard too but the fit and finish of the interior feels fragile, the plastics are hard and shiny and I didn’t feel any confidence that the switchgear would still be working properly in a couple of year’s time. All pretty much what you would expect from Jeep then! Jeep offer a pair of petrol engines with the Compass or a 2.2 litre diesel sourced from Mercedes. The two wheel drive version kicks out 134bhp but the 4×4 has 161bhp as standard. The engine is nicely refined and gives you all the grunt you need with a respectable 125mph top whack and a sub 10 second 0-62 time. I managed 42mpg as well, not bad for a car like this. Although I didn’t take it off road I’ve no reason to doubt that it would acquit itself well in the mucky stuff. Unfortunately, it doesn’t fare so well on the tarmac; the ride is bouncy on any kind of rough road surface and there is way too much roll through the corners. I thought the whole point of a crossover was meant to be that it drives like a hatchback. All in all the Compass is not a bad effort; it’s certainly an improvement on the previous model. I really don’t think that it is quite good enough though; it doesn’t have the drivability of the Nissan Qashqai and it lacks the prestige of the two wheel drive Land Rover Freelander. Chrysler, Jeep’s parent company, has now merged with Fiat and the Compass will be replaced next year by an all new Fiat based model. My concern is that the Compass is serving to downgrade the Jeep name, a global brand that has been over sixty years in the making. General motors made a similar mistake when they handed the blue collar icon of the Chevrolet brand to some sad little cars from Korea – remember Daewoo? Rather than using the Jeep brand to add kudos to a Fiat, perhaps Chrysler should concentrate on producing a car good enough to add kudos to the Jeep brand. Audi has now become the marque of choice for upwardly mobile young professionals and many more people besides. Virtually every model Audi makes has its own S version which features high powered engines, uprated suspension and brakes and four wheel drive to handle all that power. Here is my pick of the bunch. The A3 is Audi’s answer to the VW Golf, compact, nimble and practical. Throw in a 1.8 litre engine turbocharged to produce 225bhp and an intelligent four wheel system and you have the ultimate upmarket hot hatch. The understated looks are enhanced by the big alloys and you get that legendary Audi build quality. As you might imagine, it goes like stink with 60 mph coming up in 6.6 seconds and the ability to top 150. It also corners like its on rails but it isn’t as much fun to drive as a Golf GTi. Audi’s current desirability is reflected in the price; shop around and you can get an ’02 model with 70k on the clock for £5,500. For: Build Quality, performance, family car practicality. The A4 is a compact sporty saloon that also comes in estate and cabriolet guises. Turning it into an S4 involves adding a monstrous 4.2 litre V8 serving up a wholesome 335bhp. The vital statistics are 5.6 seconds and 155mph and the excellent Quattro system delivers superlative road holding in any conditions. As the top of the range model it offers all the goodies – leather, satnav and electric everything and it is as well screwed together as anything on the road. This is a handsome car and the cabriolet particularly is a timeless classic. It is worth buying an S4 just for the thunderous bellow of that magnificent V8. An ‘04 model with 75,000 miles under its belt will set you back £9000. This big executive bruiser comes as a saloon or an estate but the estate is definitely the one to go for. The power comes from the same engine as in the S4 and the performance is pretty much identical. There is masses of space in both the front and rear and the big boot makes it immensely practical. It handles better than any car this size has any right to do and yet is remarkably smooth riding. The sleek styling won awards when the A6 was first launched and it still looks the part now. The previous version of the S6 is good value too; expect to pay about £7000 for an ’03 plate that has covered 80,000 miles. Audi’s flagship luxury saloon lends itself nicely to the S treatment. The original model is too old for consideration now and the 340bhp engine doesn’t really cut the mustard these days. However, the most recent version is a real eye opener. Audi have borrowed the magnificent 5.2 litre V10 from the Lamborghini Gallardo, though it is tuned more for torque than outright horsepower and so has to make do with a mere 450bhp. That’s still enough to punt it to 62mph in 5 seconds and without the speed limiter it would top 190! This car is immensely spacious, hugely luxurious, staggeringly well equipped and corners like the Lambo it borrowed the engine from. You’ll have to dig deep if you want one though; £20k puts you in a 5 year old example with 100,000 miles on it. Alfa Romeos are known as cars that you buy with your heart rather than your head. With dreadful build quality, deeply flawed designs and appalling reliability being the rule rather than the exception, it is little wonder why. However, Alfas are much better than they used to be – here are four second hand bargains that won’t drive you to the depths of despair. The 159 is Alfa’s answer to the BMW 3 series and it makes a very good job of it. Top of its appeal are those ravishing looks with the distinctive triple headlights either side of the classic Alfa grille. It’s comfy, reasonably spacious and comes with bags of kit as standard. The handling is safe rather than scintillating but the ride knocks spots off its German rivals. There’s a range of engines to choose from but I’d pick the 185bhp 2.2 petrol which sounds fantastic or the 200bhp 2.4 diesel which delivers hefty performance. This car is a real bargain, £6500 gets you an 06 model 2.2 petrol with 75k on the clock. Expect to pay another £500 for a similar age 2.4 diesel. For: Stunning looks, comfort, equipment levels. Against: Lifeless handling, electrical niggles. The GTV is a 2+2 coupé that is also available as a two seater Spider soft top. Oddly, while it looks sensational as a coupé, it looks distinctly odd as a Spider and removing the roof also turns the handling from bad to terrible. The interior is a lovely place to be and you have a choice of two great engines, a 2.0 litre 150bhp twin spark or a 3.0 litre 220bhp V6. The V6 delivers blistering performance but all that weight in the front makes the handling worse still, choose the compromise you prefer. 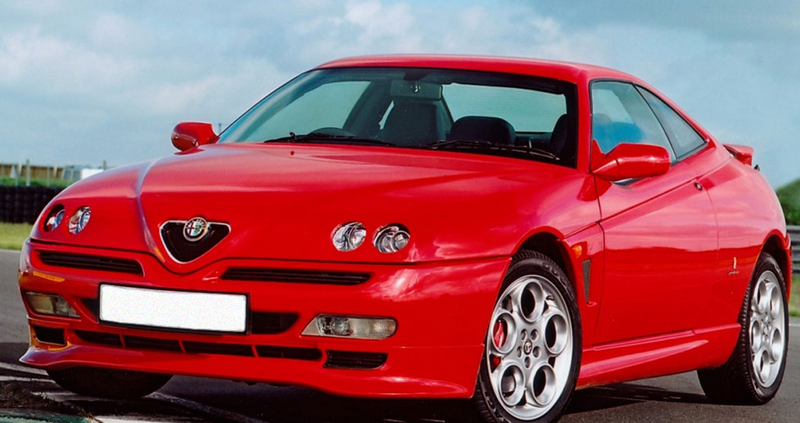 The GTV is a true Alfa Romeo; the design flaws are many and various. You can’t open the doors in a car park, the turning circle is immense and the driving position is designed for an Orang-utan. They’re good value though; £4500 will buy a V6 ’03 model with about 60k on the clock. The 166 is a big, well equipped executive saloon along the lines of a Mercedes E Class. It doesn’t have the most dramatic styling Alfa Romeo has ever produced but is still a pretty handsome brute. It rides and handles nicely and benefits from those charismatic Alfa petrol engines, though the diesels are a bit weedy if very refined. For some reason, executive car buyers stayed away in their droves making the 166 one of the fastest depreciating cars of all time. These days, £6000 will get you an ‘04 model V6 with modest mileage, luxury motoring at a bargain basement price. This car is Alfa’s answer to the Ford Focus – compact, practical yet all wrapped up in a Hugo Boss suit. A base spec 1.6 litre model is a little plain Jane but the 2.0 litre Lusso with leather seats and gorgeous alloys is a car that truly stands out from the crowd. The styling got an upgrade in 2005 and the suit graduated to a Paul Smith. Throw in tidy handling, an easy ride and those peppy engines and you really have a winning formula. Like most Alfas, the 147 depreciates like a sinking stone so £5,000 puts you in a 2006 model with 60k under its belt.